One of the first men to enter Hiroshima after the explosion was a British doctor looking for survivors. He picked up a bowl and a jug, the type eaten out of everyday in Japanese households. Banal and undistinguished, deemed of no cultural value, the bowl and jug were now blackened and broken by the blast. The two household items had been exposed to temperatures exceeding 900°C, their exteriors glazed not once but twice, transforming these functional, throwaway objects into demonstrative phenomena, evocative of the disparate vernaculars of human society. John Strutton is not a nuclear explosion, yet, in his hands, the wealth of ephemera that life has presented him is similarly metamorphosed. The beginnings of this evolution is evident over every inch of space on the walls and shelves of his studio. 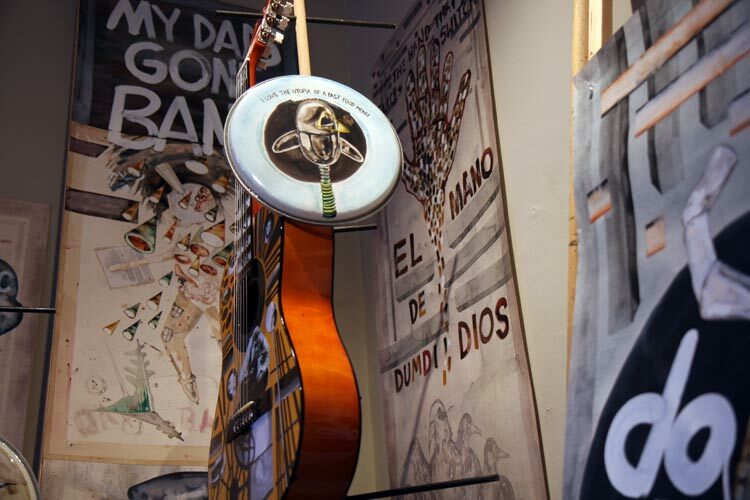 Naked drum skins and bare guitars line up above books and postcards depicting everything from Donatello to Ian Dury, with a pit–stop at Tony Hancock. Every morning, before logic kicks in, Strutton weaves the threads of his subconscious together; Carel Fabritius’ goldfinch begins to hum along to The Specials, the skeleton bones of the Misfits shake hands with Dürer, chats from the pub spiralling into the humble form of doodle. In a saturated cultural landscape dividers such as genre, era or medium are used to make things comprehensible. Inside a person, these demarcations vanish and everything jumbles up again, a phenomenon Strutton’s work stays true to. He proudly exhibits his role as a fan, but not simply by buying into and displaying his devotions. Rather than collating cultural markers as points of reference, he alights upon them as a starting point for the dispersal of his own ideas. 'High' and 'low' brow are set on equal footing – bastardised song lyrics become warped sloganeering, record covers and advertising are satirised in the DIY spirit of punk to warn of psychic ills, the works of early Dutch Masters are imploded within sci–fi cosmoses. The results have the semblance of something you have been convinced of all your life but are sure you have never seen before. Strutton catalogues and creates simultaneously, in the same way the internet works. Anything from PJ Harvey to your mum's knitting circle, from Asda supermarkets to theories on the afterlife has a webpage. Content, which we consider it impossible to find similarity between is equalised into a cohesive whole by the format in which it is presented. From here, the Internet finds a life of it own, shaped by users bookmarking pages, creating links between sites, adding comments, deleting information. Painting is Strutton’s great leveller, allowing him to own alien ideas unreservedly and consolidate them seamlessly with his own. But the old–fashioned craftsmanship intonates a new discord. The perfect brush strokes and immaculate rendering of form is surely the antithesis of the contemporary practice of collage and re–appropriation, as well as as begging the question why, if one is capable of creating such perfect representations of subject, would a painter choose to depict the garish cartoons or brash designed surfaces populating Strutton’s surfaces? The schizophrenic nature of Strutton’s work is unrelenting. One could marvel over the fierce three–dimensionality of his characters, if they weren’t so busy wondering why an alien is wearing boxing gloves, or a a telephone pylon and a wiggly–formed apology bisects a world into halves. If one work surfs happily through countless dimensions, another, beside it chimes with the flat design of propaganda. Just as Strutton refuses to leave other people’s attempts alone, so his own creations are put through the mill time after time. Madcap mantras float off the page to be heard triumphant in the lyrics of a song. The smooth pencilled lines on a page shirk their responsibilities and are found moonlighting, in thick oils over the voluptuous and functional body of a guitar. Painting borrows from animation, drawings are animated through installation, nothing is sacred, morphing from one form to another. He creates countless constantly shifting realities, worlds constructed of quicksand. This distinct lack of completeness oddly suggests a sort of entirety, that finite surfaces can be penetrated, giving way to wormholes, which you could burrow through for hours only to emerge from the point you began. It is a working demonstration of how we rewrite history everyday. Strutton undermines how sure we are of the world. Sure you can see it, you can touch it, you can feel it, you know how it got there, but how, on God’s earth did these simple little creations, with no interference from you, get themselves in such an ungodly tangle? Iphgenia Baal, London, February 2009. Domo Baal is delighted to host John Strutton's first solo exhibition in the gallery. This follows on directly from a solo project booth showing 'Donderslag' at Volta NY. Since 1999, Strutton’s practice has taken the form of drawing, installation, video, animation and performance. The work often uses the strategy of accrual to deal with a visual form of veneration and cultural reclamation. The resulting installations, of paintings, drawings and objects become a kind of makeshift memorial, an ex voto offering where nostalgia becomes a form of revenge. The sedimentary process creates a convoluted cosmos of effigies, mandalas, portraits and trophies, a graveyard whose architecture is sustained by anxiety. Sometimes brutal, often absurd, his approach to figuration is fractured, automatic and schizophrenic. He shares a preoccupation with ritualistic process, debased iconographies and compulsive aesthetics with the likes of Austin Osman Spare and Antonin Artaud. He is currently Senior Tutor in Painting at the Royal College of Art, London. He formed The Band of Nod in 1999 and is co founder/director of 39, a project space in London. Since 2005 he has been writing and performing in his band Arthur Brick. Arthur Brick will be performing a selection of songs from their forthcoming EP 'Original Swiss Wedding' on the opening night. A video of Arthur Brick's Gig will be sreened for the duration of the exhibition. Finissage: Saturday 9 May from 6 to 8pm (during which, there might well be a performance) to be followed by a pub crawl.